Ms. Rownaq Jahan joined the Ministry of Expatriates’ Welfare & Overseas Employment as the Secretary-in-Charge on 20 September 2018. 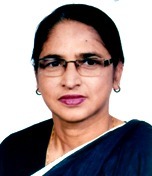 Prior to this, Ms. Jahan had been leading The National Institute of Population Research and Training (NIPORT) as the Director General since 10 January 2016. Ms. Jahan is a member of the BCS (Admin) Cadre, 1985 Batch. Since joining the service in 1988, she had worked as Assistant Secretary/Senior Assistant Secretary in the Planning Division, the Ministry of Health and Family Welfare and the Ministry of Education. Besides, she served as Upazilla Nirbahi Officer (UNO) at Narsingdi Sadar. Afterwards she served the Ministry of Hill Tracts Affairs. While working in the Ministry of Establishment, now renamed as the Ministry of Public Administration, she was promoted to Deputy Secretary in 2006. Subsequently, she worked in the Economic Relations Division as a Deputy Secretary and was given the responsibility of Asia and Joint Economic Commission Branch. After that, she worked as a Deputy Secretary in the Ministry of Shipping for two years and was again posted to the Economic Relations Division. While working in ERD, she was promoted to Joint Secretary and, later to Additional Secretary. She discharged her duties in the Asian Development Wing and World Bank wing of ERD with reputation. She successfully completed foundation and department trainings as well as MATT (managing at the top) course at BPATC followed by a foreign exposure visit to Singapore Civil Service College, Private and Public Service Partnership (PPP) course at BPATC and Capstone Course at NDC. She studied at ISS in the Netherland and earned a Diploma degree on Population and Development. Recently she participated in two short courses on Good Governance, International Dispute all small Settlement, Negotiation Techniques, Environmental policy analysis at Duke University, USA and Potsdam University, Germany. For official purpose, she also visited many countries of Asia, Europe, Africa & Australia. She earned her Honours degree in English literature and MSS degree in Social Welfare from the University of Dhaka. She is happily married and blessed with two daughters.